These Web-browser based mobile casinos (no downloads necessary) allow players to place a Web app icon directly on the homescreen of their device for ease of access, replicating a market app but without taking up nearly as much space. Set up an account at one of these sites and take full advantage of the sign-up bonuses available. Registering your details takes no more than a couple of minutes and once you’ve done so, you’ll have the one username and one password to access the casino via all mediums (online, mobile and tablet). Practice before betting for real – Each of the casinos we recommend allow you to play for free and practice without any commitment to play for real money, so you can test and increase your skills on the different 21 game types available before playing for actual cash. Prefer safe downloadable software for your Android? 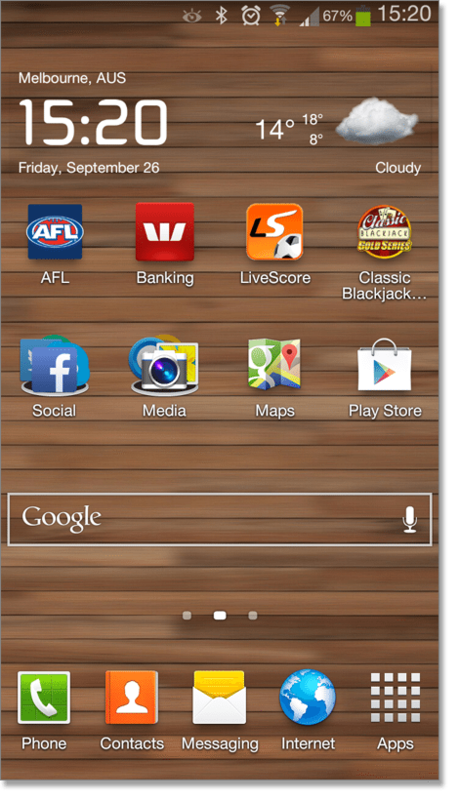 Royal Vegas Casino owns a dedicated market app available for download from Google Play. It is branded Regal Vegas Casino for marketing purposes, and once installed, Android users gain access to two interfaces: a practice play interface (Regal Vegas) and a real money interface (Royal Vegas). While there are certain restrictions which apply within Australia to mobile gambling, the ban is loosely regulated and has limited measures to enforce its provisions for offshore gaming companies. It does not restrict us from gambling via mobile casinos (accessing their services). Each of our endorsed sites are licensed and regulated by independent gaming authorities such as eCOGRA (the eCommerce Online Gaming Regulation Assurance body). 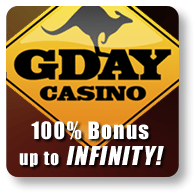 All online casinos have a selection of deposit and withdrawal methods to suit your needs. Make sure you have a reliable data connection when making your deposits and processing any withdrawals in order to protect your money. If you do lose connection mid deposit or withdrawal, this will be identified and you’ll be able to continue from where you left off once you reconnect. 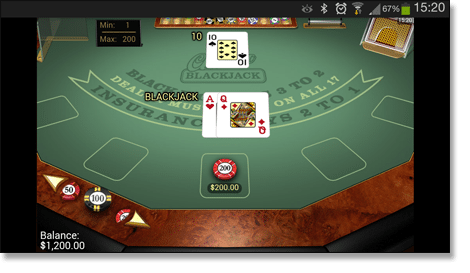 Multiple Versions: Online casinos offer a large variety of blackjack games, and their mobile sites are fast catching up. While the scope for such a massive selection mightn’t be as big on a mobile or tablet device, there is a heap more choices of game styles available on mobiles than at land-based casinos. Blackjack Switch, Pontoon and Spanish 21 are a few of the blackjack styles available. Solid Graphics and Gameplay: The graphics and game-play of blackjack offered by online casinos for Android devices are very strong and run smoothly and effectively through apps and browser. With software developers such as Microgaming, BetSoft and NetEnt competing against each other to provide the best and most innovative games, we can rest assured gameplay is first-class. Customer Support: Playing through a mobile casino gives you the ability to seek out customer support if need be. The three casinos we have suggested have live chat available 24/7, contact via email and toll free phone numbers. Mobile casinos offer a variety of one of the most popular and strategic games in the casino – one with a house edge which can be reduced to less than 1% with correct strategy – for smartphones and tablets.